ElectronicLocal: Follow-up to Friday's T-Bond Post. Great Trade! Follow-up to Friday's T-Bond Post. Great Trade! Friday's post showed what was possible in the T-Bonds. As it turned out, price went lower after my post so the market opened inside the VA. My bias, of course, was down so I was looking for a sell. 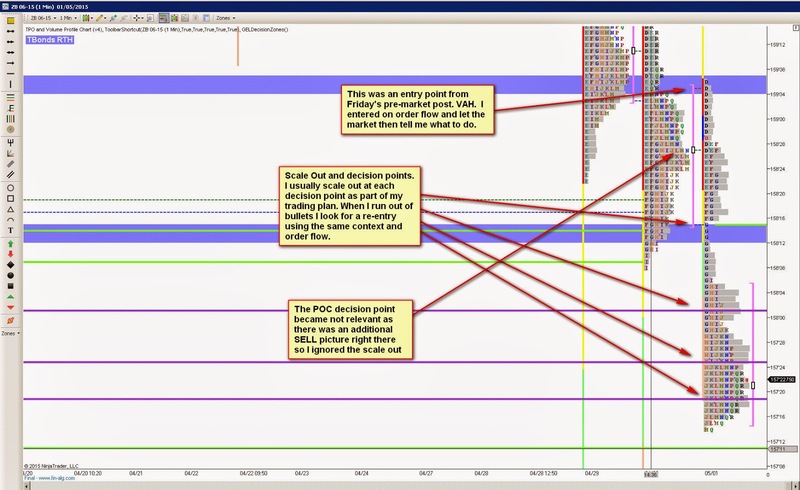 Although it opened at the POC I didn't take a LONG because of my envisioning but I was ready to sell at the VAH. The pic tells the rest of the story. The level of profits on this trade were very dependent on what the trade management strategy was in my trading plan. Scaling out allowed for better profitability although the bulk of my profits were taken at the VAL with a trailing stop after that. I plan on adding Part 1 of the eBook to this blog soon. Look for a separate TAB when you arrive at the blog. habra q probar el NT8.0 a ver si se pueden ver las deltas in situ en los graficos?